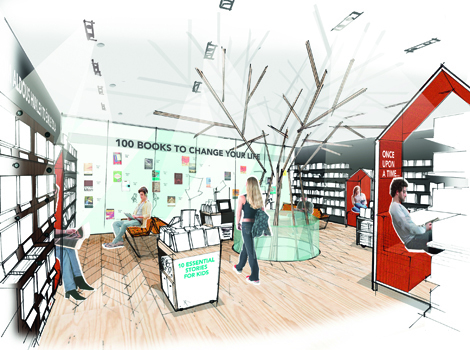 Reinventing the Book Shop | Passing Through . . . . When online shopping offers choice, convenience and competitive prices, why would anyone go to an actual shop? To try on clothes, perhaps. To sit on sofas or lie on beds. But if you’re after music, film or books, you’re more likely to go straight to the internet. In the digital age, bricks-and-mortar shops have to work much harder to attract our attention, let alone custom. Brands rip out and refit their stores every few years: interior design is, clearly, already crucial to their fortunes. But could design go further, and lure us away from our tablets and back onto the high street? Curious to explore this territory, we asked four leading architecture and design practices to create a shop. Specifically, in the age of Amazon and e-books, a bookshop to save bookshops. Traditional bookselling has been hit particularly hard by the shift to online shopping. First the sales went digital—to Amazon. Then the product went digital—again, largely to Amazon, whose Kindle e-readers are configured only to read e-books in Kindle format. In Britain, the number of independent bookshops fell by a third between 2005 and the end of 2013, to 987; in America, it fell from 2,400 to 1,900 between 2002 and 2011, although there has been a modest revival since. Some of the reasons for this decline apply to the whole high street—the recession, edge-of-town superstores, crippling business rates—but Amazon has struck by far the mightiest blow. Still, independent bookshops inspire great affection, and the best of them, such as Lutyens & Rubinstein in west London, run by literary agents, offer more astute personal advice than an algorithm ever could. What indies seldom do is integrate technology beyond the till, or sell e-books. They will surely need to innovate to survive. We gave each practice—Gensler, 20.20, Burdifi­lek and Coffey Architects—the same brief. They were to design a general-interest bookshop, selling fiction, non-fiction and e-books, in store and online, on a typical European high-street site, with two floors of 1,000 square feet each. The budget was £100,000—modest, we knew, but independent booksellers aren’t minted and that figure was ring-fenced for the fit-out; they could assume there would be further funds for training staff or running events. The shop could be called Intelligent Life Books, or given another name. We were expecting some arresting design and clever innovation, but got a lot more than that. If the brief was to redesign the bookshop, they reinvented it. You might have expected as much from Gensler (right), where the brief was taken on by Jon Tollit, who led the team that designed much of the Apple Store on Regent Street in central London. When it opened in 2004, the Apple Store made instant retail history by putting its products on tables for customers to use, removing tills and providing staff so knowledgeable that “you can ask anyone any question”. In January, I went to Gensler’s London office—one of 46 around the world—to see the work in progress. We began with Tollit’s associate, Owain Roberts, laying out the firm’s ideas in black and white, unfurling a long scroll of tracing paper on which he had mapped out the challenges facing booksellers with pen and ink, distilling them in drawings and diagrams of startling clarity. Their analysis was stark: “Design on its own will not save the bookshop.” But Roberts was undaunted. “If you leave the model as it is and redecorate, nothing’s going to change. The solution needs to be much more fundamental: informed, strategic and daring.” The bookshop, as Gensler saw it, had to anticipate every sort of literary need, from grabbing a paperback or download, to relaxed browsing, personally tailored reading-lists, self-publishing, book clubs, author events and even an enhanced experience of reading a book in the bookish equivalent of a flotation tank. A week later, Roberts produces a bird’s-eye view of Gensler’s bookshop, another disarmingly simple drawing containing a lot of original ideas. The first surprise is that you don’t have to enter the store to shop from it: the glass façade is a touchscreen that can be tapped on to download e-books from QR codes. The choice could be infinite—“the whole catalogue of the British Library,” said Roberts, taking on Amazon with a sheet of smart glass. A vending wall swings out onto the pavement, popping out a changing selection of paperbacks. Inside, new titles are laid out on a long table that marches down the space. To one side, there’s a “Harry Potter wonderwall of discovery”, to be explored by ladder (ignoring, for the moment, health and safety). While customers can be in and out of the shop in a matter of minutes, the back half of the store caters to those who can stay longer. Literary sommeliers advise on what to read next, or usher you into a pod for a multi­sensory experience: you curl up and read a hardback with an appropriate drink (tea for Austen, whisky for Hemingway), soundtrack or even smell. Readers wanting a more social experience gather on bleacher seating (“simple timber steps with cushions”) to take part in book clubs, hear an author give a talk or discuss self-publishing, which can be done via screens in the far left-hand corner. As they’ve drawn it, tl;dr seems a destination store, somewhere you’d happily spend a Sunday afternoon, but Roberts and Tollit also produce diagrams showing the concept as “a kit of parts” to “plug in and play” according to location and audience. At a railway station, tl;dr might be just a download-and-vending wall. In a hipster neighbourhood such as Hoxton or Williamsburg, it might feel more like a club. “It can grow, shrink and respond to the way people are shopping the store or it could pop up elsewhere.” Putting a tl;dr vending machine at the end of Brighton Pier, for example, where it would sell “Brighton Rock”, and promote the nearest fully equipped store. In 20.20’s bookshop (top) people could do all sorts of things: download reviews and e-books (which would be discounted if bought in person), buy printed books from a frequently edited selection, consult well-informed staff, have a coffee or sandwich, read in cubby­holes, listen to audio books, watch a performance by an author, rent a desk at which to write or illustrate, and self-publish on the in-house printing press. The shop would be called The Art of Storytelling, the thinking being that stories endure, no matter what form books take. Lee and Jim Thompson, 20.20’s managing director, talked persuasively about the nuts and bolts of their bookshop. Like many, it would have a café, but theirs came with a twist: a Yo! Sushi-style conveyor belt delivering short reads and reviews to consume with your coffee. This would act as a draw to the back of the shop—“you need some kind of anchor,” Lee said—while mobile “mid-floor units” carry screens to advertise events, and books that fit a frequently changed theme, such as the ten best adventure stories. These units (at hip height, “because we all tend to look down”) also offer some cover at the threshold—a place for nervous shoppers to hover while they orientate themselves in an unfamiliar place. The books would be front-facing “to ping out the covers” against charcoal shelves. Strong visual merchandising, but wouldn’t it mean fewer books? Not if some were kept in drawers, with one book on the front of the drawer and the rest of the author’s work inside. The department store Liberty did something similar, putting “the shirt on the front, with a tie,” Thompson said, “and you pulled the drawer out and all the sizes were stacked behind”. Like Gensler, 20.20 were unfazed by the tight budget. The tree, conveyor belt and drawers would eat up most of the money, Lee said, while “everything else is quite inexpensive and easy to produce”. This strategy seems sound: woo customers through the doorwith a few striking features and then make it as easy as possible for them to buy something. As soon as they have their nose in a book, they’re not going to mind if the floor isn’t parquet. Above All things to all readers: customers can download an e-book or buy a paperback in an instant at the front of Gensler’s multi-faceted bookshop, or immerse themselves in a literary experience for hours at the back. I dread the day when bookshops cease to exist, as much as I love my ipad and the ability to purchase books online, the experience of losing time browsing through a good bookshop is still one I value. An interesting tend , especially in Europe and now gradually coming to Canada, is how public libraries are patterning themselves on a similar model of redesign. Some complain, that in some cases, the library becomes too much like a Chapters bookstore, but if some of these changes makes the library more social community oriented and entices the non-reader/limited reader into the environment then the change is effective.